This year I turned 30. Today I’m looking back to the year 1980, the year I entered the wide world, and a fragrance that won the Fifi for “Most Successful Women’s fragrance (limited*)”. I realize that the winner in this category for 2010 is by Marc Jacobs (Lola? Daisy? ), but I’m going to ignore this and assume that back in 1980 a Fifi meant something. … And the winner is: Galanos! Galanos? Never heard of it. Time to do some research. 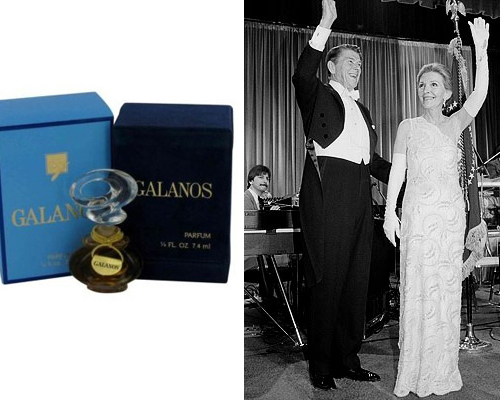 James Galanos is a Greek-American designer famous for attiring First Lady Nancy Reagan. Hey, they can’t all clothe Jackie O.
Galanos the fragrance was released in 1979, and notes include coriander, carnation, cypress, gardenia, tonka bean, bay leaf, musk, vanilla, jasmine, cloves, oakmoss, lily-of-the-valley, cedar, rose and geranium. Sounds good! I’ve found it on eBay for what is, by today’s standards, a steal. It’s available as EDT, EDP, and Parfum; so of course, I’m going for the parfum (it has the best bottle!). I just paid $32 for 7.5mL shipped; it should arrive in about a week, at which point I’ll talk more about it. Not surprisingly, there isn’t anything in the blogging world (that I can find) about this relic, so it will be fun to review something that no one cares about.